This lens is brand new. I bought it mid-July 2013, along with the DA 40mm Ltd., for a trip to Disney World at the beginning of August. Well, the DA 40mm Ltd. stayed on my camera 99% of the time. Out of the 3,300 pics I took, I used the 18-135 for 53. And now I'm back from Disney and no longer need this lens. Comes with a Tiffen UV filter to protect the glass, rear and front caps (both original), and the original lens hood. Also comes with the manual. 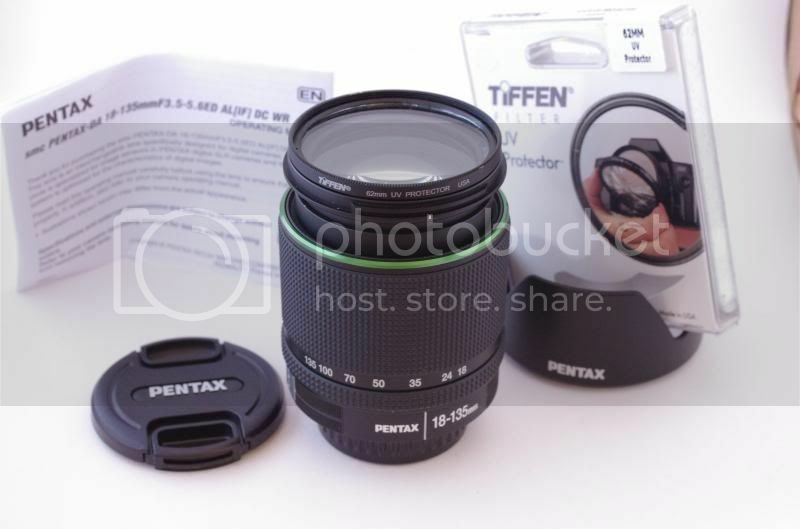 I bought this lens as a "kit" with my lovely new K-5ii, so I do not have an original Pentax box for this lens, but I will bubble wrap it, put it in a small box, then put that box in peanuts inside a larger box. It will be handled and packaged with loving care. $325 includes shipping in the continental US. For int'l shipping, contact me first as I'm kind of a newb when it comes to that. Payment via paypal. PM for more info. Return policy? It's in like new or mint condition.